Word has surely got out around the island of Solis by now: if you’re going to work with the resistance, whatever you do, don’t embark on a mission with Rico Rodriguez. Those who do never return, and their demise is anything but dignified. First there was the hacker I took along to break into a facility full of exploding red thingies. His job was to hack (obviously) into a series of consoles while I covered him. He perished in the sea when a helicopter rocket derailed my van’s path just as I hit a ramp. In a different save, he met his end standing stubbornly in front of an indestructible mortar and demanding I pick him up there, precisely there, in a vehicle. It took me six cars to figure out that the task was simply impossible – had it not been for a fortuitous autosave, I’d still be there now. He expired one more time when an errant explosion – there are rather a lot of explosions in the minute-by-minute happenings of Just Cause 4 – wedged our car under a bridge just after I’d exited it. Rather than leaving through either of the unobstructed driver side doors, he sat in there for a full three minutes while I, oblivious, fought off a barrage of infantry, helicopters, attack bikes, and armoured cars, all the while wondering why he hadn’t started hacking the last console yet. Since that mission, when Rico’s (my) incompetence was laid bare, I’ve probably lost a hundred resistance fighters. I’ve lost everyone I’ve ever driven a vehicle with, because I’m in a game-long battle with the vehicle camera controls. I lost accomplice Maia on a busy freeway because, once again, I hit a ramp slightly awkwardly following a bump from a pursuing car, and was consequently juggled to death by passing traffic while she waited under a hail of machine gun fire for me to return in a vehicle. I myself have been killed an extraordinary number of times having followed the directional arrows guiding me to a checkpoint and discovered, too late, that they’re in fact guiding me in the exact opposite direction to my objective. And I suppose I shouldn’t be surprised about that. 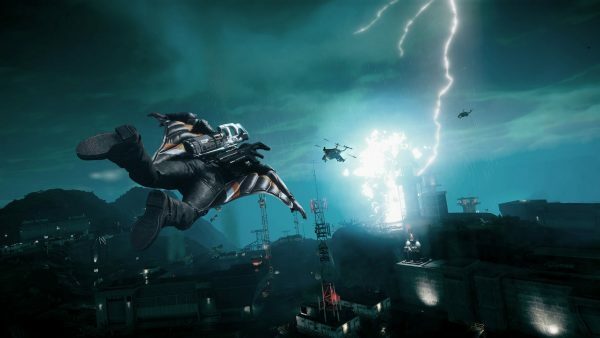 Just Cause has always been about chaos, hasn’t it? 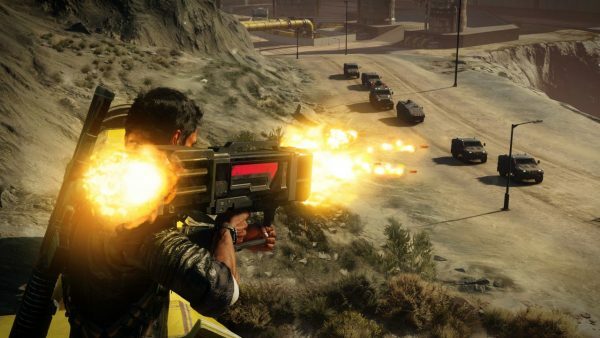 The first game, a showcase for the Xbox 360’s large-scale environment tech, felt like playing a Grand Theft Auto game on a perpetual five-star wanted rating. Subsequent entries have only ramped up that feeling of constant mayhem, bestowing a wonderful toolset on you that genuinely negates the need to ever have to run anywhere, or even fire a conventional firearm. And when it all lines up, those franchise tenets are exhilarating and unique in Just Cause 4. When its missions play out as its designers obviously intended, it feels great. When it doesn’t, the fundamental structure of those missions falls apart. And it gives me no great pleasure to say this, but it almost never plays out as intended. That’s ironic, really, because often that spontaneity is considered a real virtue in open-world games. They attract words like ‘systemic’ and ‘emergent’, partly because their publishers have rammed those words down our throats for a decade now but primarily because we love to feel like game worlds function without us. When a wild animal turns up in a Far Cry game and derails your stealth mission, you roll with it. That’s just some lovely emergent gameplay prompted by the systemic open world, you say, unloading an Uzi into an endangered mammal’s mouth. But when you fail a mission in Just Cause 4 because an NPC you’re escorting has become hopelessly stuck on a fragment of a satellite dish you blew up a minute ago, it’s a different matter. That’s the difference: the emergent gameplay always tends to derail and frustrate you here, rather than entice you into other activities throughout its open world. What an open world Solis is though – as vast as it is geographically improbable. There’s an icy, mountainous biome in the middle of the map, whose entirety must surely make up about 12 Hammerfells. There are desert plains, meadows, rainforest, modern cities, and impoverished settlements that conjure up the Kowloon Walled City. There’s also an attempt to explain such diverse climates in the main plotline – a horrid dictator has weaponised weather, and Rico’s absolutely furious about it. Actually, the storytelling is a step forwards for the franchise in Just Cause 4: slightly less hyperactive and often landing on a more serious tone while still acknowledging the inherent silliness of one man taking over an entire island using a grappling hook. Which is, naturally, still the star of the show. 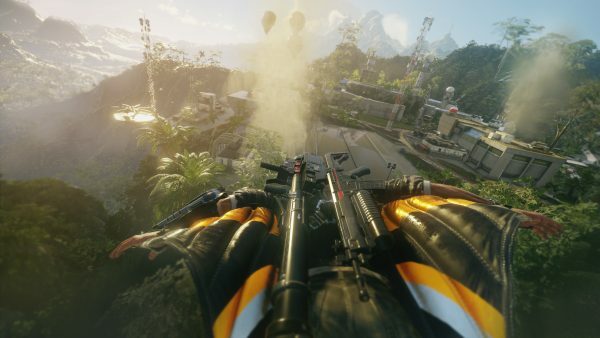 Rico’s grappling hook is the kind of mechanic you actively miss in other games, and together with his wingsuit and parachute, makes for a joyous traversal experience. This time the grappler can attach balloons to objects and have them float away (or ascend to sufficient altitude and then pop, dropping whatever you elevated to its sure destruction) or ping boosters to them. In this manner, you can turn a cargo crate into a zeppelin, send chasing vehicles flipping into oblivion, and all manner of other creative things I’m too dimwitted to think of. Except that the vast majority of the time you’re under an absolute volley of enemy fire, grenades, helicopter rockets, sniper bullets, energy weapons, and hostile weather effects. So, you know, good luck building your MacGyvered hot air balloon when standing still is death. At least you’ll look good failing. More than ever, Just Cause 4 is a handsome game which not only delights in its huge draw distances and dramatic geography, but in the tendency it has to fill those already spectacular vistas with drama. The first time I encountered a tornado was like nothing I’ve seen before: big chunks of buildings ripped up and sent spiralling around in the sky, while people and vehicles below struggle against its inevitable death-pull. The same goes for all weather effects: visually impressive, and meaningful to the player, requiring a response. The frame rate in the PC version does take a hit when these weather phenomena get going, but my GTX 1070 struggles to keep above 60fps at max settings and 1600p even in relatively calm conditions. In fact, it takes quite a lot of downparing to hit a stable 60, which is quite disappointing but not indicative of an outright broken PC port. Whatever you do, though, make sure you have the latest GPU drivers installed to avoid the constant crashes I first experienced with it. It’s a funny old game, then, Just Cause 4. Usually a game like this which features so many positives and such significant failings in tandem cancels itself out and becomes simply ‘a bit boring’. But that isn’t the case here. The pros and cons shout over one another constantly, and I think that’s why I find it such a frustrating game to play. My brain’s firing off endorphins because hurtling through an impressively realised airport while everything blows up around me is inherently enjoyable, but it’s also firing off stress hormones because there’s no good reason why the vehicle camera should be pointing in such an unhelpful direction. I’m happy because I just drove a van off a pier and into a boat full of explosive barrels for a movie director; I’m sad because an inopportune frame rate dip made me hit the boat off a little to the side and have to shoot the barrels from back onshore to trigger the explosion. And that’s how it goes while you inhabit Just Cause 4. Constant iridescent glimmers of the game it wants to be, tethered by a grappling hook cord to mechanical clunkiness.